Cypriot Arabic, also known as Cypriot Maronite Arabic or Sanna, is a moribund variety of Arabic spoken by the Maronite community of Cyprus. Formerly speakers were mostly situated in Kormakitis, but following the Turkish invasion of Cyprus in 1974, the majority relocated to the south and spread, leading to the decline of the language. Traditionally bilingual in Cypriot Greek, as of some time prior to 2000, all remaining speakers of Cypriot Arabic were over 30 years of age. A 2011 census reported that, of the 3,656 Maronite Cypriots in Republic of Cyprus-controlled areas, none declared Cypriot Arabic as their first language. Cypriot Arabic was first introduced to Cyprus by Maronites who came mainly from Syria and Lebanon as early as the seventh century, with waves of immigration up to the thirteenth century. Since 2002, it is one of UNESCO-designated severely endangered languages and, since 2008, it is recognised as a minority language of Cyprus, coinciding with an attempt to revitalise the language that may prove to be futile. 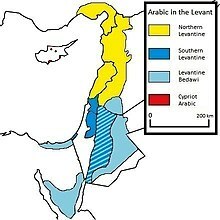 Cypriot Arabic has in the past been assigned to a Syrian-Lebanese or Levantine Arabic classification, likely owing to the contemporary presence of a large Lebanese-speaking Maronite community on the mainland. However, more recently it has been shown to share a large number of common features with the qeltu or North Mesopotamian Arabic dialects of Iraq, Syria, and Turkey, and a pre-Cypriot medieval antecedent has been deduced as belonging to this dialect area. Indications of an Aramaic substrate suggest it was close to the time of the language shift from Aramaic to Arabic; other features are common to those of Syro-Lebanese and Palestinian, which go back to a period in which there was a dialect continuum between the Mesopotamian dialects and the Syrian dialect area. In the Cypriot stage, the language was extensively restructured through contact with Modern Greek, acquiring numerous features and constraints not typical of Arabic. Essentially unintelligible to mainland Arabic speakers, it is characterized as an isolated "peripheral Arabic" along with others such as Maltese. Its Arabic component is a hybrid of dialects from diverse areas and times of Southeastern Anatolia, northern Syria, and Mesopotamia, as well as the Levant, offering unique insights into the historical evolution of Eastern Arabic. Cypriot Arabic is found in the northern shore of the Kyrenia district, in the southern shore of the Limassol district, in Nicosia and in several Maronite mountain villages. Borg (1997) argues that the sound system of Cypriot Arabic has been heavily influenced by that of Cypriot Greek. Cypriot Arabic has lost all emphatic consonants and stop-voicing opposition (though this is subject to debate in literature)—but retained gemination. Geminate voiceless stops surface as aspirates. Furthermore, Old Arabic /q/ merged with /k/, /b/ became /p/, and /d/ merged with /t/. Historical stop + stop clusters are dissimilated to fricative + stop. /k x/ are palatalized to [c ç] before /i e j/. /j/ is fully assimilated. /j/ between an obstruent and a vowel surfaces as [kj]. An epenthetic stop occurs between a nasal and a continuant or sonorant. Place of this epenthetic stop is carried over from the nasal and voicing from the succeeding consonant. Phenomena similar to the first three are also observed in Cypriot Greek. Cypriot Arabic has a large number of Syriac and Greek loans. In May 2009, the so-called "Committee of Experts for the Codification of Cypriot Maronite Arabic" submitted to the Cypriot government a proposal for the codification of Cypriot Arabic. It is unclear whether this will be in the Greek or Latin script; both have apparently been suggested. There exists a Cypriot Arabic–Greek translation dictionary, where the Greek alphabet is used for Cypriot Arabic lemmas. The linguist Alexander Borg, who specialises in the language, devised a Latin-based alphabet that the non-governmental organisation for the revitalisation of the language "Hki Fi Sanna" endorsed in 2007, and some "small texts" have apparently been translated in it. Ismi o Kumetto. Ayşo ismak l-id? My name is Kumetto. What is your name? L-aδa aş pikulullu? What is his name? Xmenye u tisca aşka pisawnna? What do eight and nine make? ^ "Arabic, Cypriot Spoken". Ethnologue. Retrieved 2018-08-08. ^ a b Council of Europe (2014), p. 4. ^ Hammarström, Harald; Forkel, Robert; Haspelmath, Martin, eds. (2017). "Cypriot Arabic". Glottolog 3.0. Jena, Germany: Max Planck Institute for the Science of Human History. ^ a b Versteegh (2001), p. 212. ^ a b Hadjioannou, Tsiplakou & Kappler (2011), p. 507. ^ a b Cypriot Arabic at Ethnologue (13th ed., 1996). ^ a b Versteegh (2011), p. 536-537. ^ Hadjioannou, Tsiplakou & Kappler (2011), p. 535. ^ "Implementation of the Charter in Cyprus". Database for the European Charter for Regional or Minority Languages. Public Foundation for European Comparative Minority Research. Archived from the original on 24 October 2011. Retrieved 20 May 2013. ^ Hadjioannou, Tsiplakou & Kappler (2011), p. 508. ^ Borg, Alexander (2004). Handbook of Oriental Studies. Section 1 The Near and Middle East. ISBN 978-90-04-13198-9. ^ Owens (2006), p. 274. ^ Versteegh (2011), p. 539. ^ Borg (2004), p. xviii-xix. ^ Versteegh (2011), p. 541. ^ "Arabic, Cypriot Spoken". Ethnologue. Retrieved 2018-07-16. ^ a b Borg (1997), p. 228. ^ Borg (1997), p. 229. ^ Borg (1997), pp. 228–229. ^ Borg (1997), pp. 222–223. ^ Borg (1997), pp. 223–225. ^ Council of Europe (2011), p. 3. ^ a b Public Foundation for European Comparative Minority Research (2006), p. 12. ^ Hki Fi Sanna & Ztite (2008), p. 3. ^ Katsioloudis, Koumettos (2008). "First steps in Cypriot Maronite Arabic (CMA), Lesson 1/Μάθημα 1" (PDF) (handout). Archived from the original (PDF) on 2014-03-18. "Cypriot Maronite Arabic in Cyprus through the lenses of the European Charter for Regional or Minority Languages". Public Foundation for European Comparative Minority Research. 2006. Archived from the original on 2013-05-08. Borg, Alexander (1985). Cypriot Arabic: A Historical and Comparative Investigation into the Phonology and Morphology of the Arabic Vernacular Spoken by the Maronites of Kormakiti Village in the Kyrenia District of North-Western Cyprus. Stuttgart: Deutsche Morgenländische Gesellschaft. ISBN 3-515-03999-6. Borg, Alexander (1997). "Cypriot Arabic Phonology". In Kaye, Alan S. (ed.). Phonologies of Asia and Africa (including the Caucasus). 1. Winona Lake, Indiana: Eisenbrauns. pp. 219–244. ISBN 1-57506-017-5. Borg, Alexander (2004). A Comparative Glossary of Cypriot Maronite Arabic (Arabic-English). Brill. ISBN 90-04-13198-1. Council of Europe (2011-01-18). "European Charter for Regional or Minority Languages. Third periodical presented to the Secretary General of the Council of Europe in accordance with Article 15 of the Charter. CYPRUS" (PDF). Council of Europe (2014-01-16). "European Charter for Regional or Minority Languages. Fourth periodical presented to the Secretary General of the Council of Europe in accordance with Article 15 of the Charter. CYPRUS" (PDF). Hadjioannou, Xenia; Tsiplakou, Stavroula; Kappler, Matthias (2011). "Language policy and language planning in Cyprus". Current Issues in Language Planning. Routledge. 12 (4): 503–569. doi:10.1080/14664208.2011.629113. Hki Fi Sanna; Ztite, Kermia (2008). "Comments in accordance with Article 16.2 of the European Charter for Regional or Minority Languages" (PDF). Hki Fi Sanna. Archived from the original (PDF) on 2014-03-26. Owens, Jonathan (2006). A Linguistic History of Arabic. Oxford University Press. ISBN 0-19-929082-2. Thomas, George J. (2000). "The Spoken Arabic Dialect Of The Maronites Of Cyprus". The Journal of Maronite Studies. 4 (1). Tsiapera, Maria (1969). A Descriptive Analysis of Cypriot Maronite Arabic. The Hague: Mouton. Versteegh, Kees (2001). The Arabic Language. Edinburgh University Press. ISBN 0-7486-1436-2. Versteegh, Kees (2011). Encyclopedia of Arabic Language and Linguistics. Brill. ISBN 978-90-04-14976-2.